The Onion AV Club's editor has been reviewing a stash of pulpy paperbacks he got at a garage sale, and now Keith Phipps has hit on a fascinating double-novel by a semi-forgotten author. 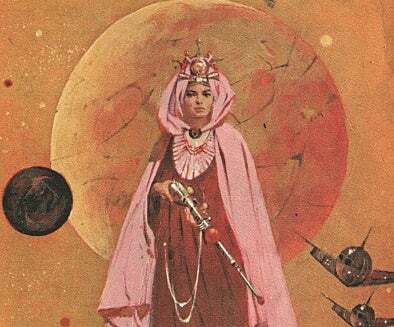 It's sort of twisted, quasi-feminist Barsoom fan-fiction. Chandler's background is pretty evident in the two novels collected in Ace Double M-129. Both concern men and women serving in intergalactic navies, and both feature alien races subjugated by the colonizing forces of more technologically advanced cultures, areas of concern no doubt inspired by Chandler's life and surroundings. But two other less-expected themes poke through in each: the role strong women could play in traditionally male-dominated cultures, and the push and pull between the fictions we consume and the world around us.